The Oklahoma Water Science Center performs computer simulations using MODFLOW to simulate groundwater/surface-water interaction, quantify groundwater resources, and evaluate the effects of withdrawals on future groundwater supplies for various aquifers in Oklahoma. Groundwater models have become increasingly important in solving scientific problems related to groundwater flow and availability in aquifers around the United States. 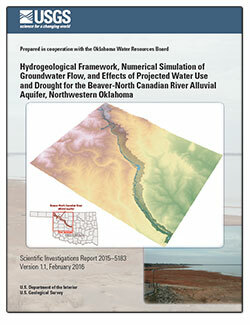 To this end, the Oklahoma Water Science Center performs computer simulations using MODFLOW (Harbaugh, 2005), USGS’s three-dimensional finite-difference numerical groundwater-modeling code. This code is used to simulate groundwater/surface-water interaction, quantify groundwater resources, and evaluate the effects of withdrawals on future groundwater supplies for various aquifers in Oklahoma. To improve the fit between model-simulated data and observed or estimated data, automated model calibration is performed using the object-oriented parameter estimation code PEST (Doherty, 2010), BeoPEST (Schreüder, 2009), a parallelized verison of PEST, and PEST++ (Welter and others, 2015). The BeoPEST and PEST++ codes are implemented on an in-house high performance computing array providing access to concentrated parallel computing resources to solve complex or computation-heavy problems. This parallel approach enables groundwater modeling and data analysis on a scale that is not otherwise possible using a single-PC arrangement. Simulation of coupled groundwater/surface-water interaction using MODFLOW and a variety of MODFLOW-related packages. Estimation of spatially-distributed recharge using the soil-water-balance code (Westenbroek and others, 2010) based on daily climatological data from 121 Mesonet stations located around Oklahoma. Application of optimization techniques to find the best allocation of surface-water and groundwater resources. Dedicated high performance computing array capable of running over 150 simultaneous processes, such as numerical and climatological models, statistical methods, or uncertainty analysis. Ellis, J.H., Mashburn, S.L., Graves, G.M., Peterson, S.M., Smith, S.J., Fuhrig, L.T., Wagner, D.L., and Sanford, J.E., 2017, Hydrogeology and simulation of groundwater flow and analysis of projected water use for the Canadian River alluvial aquifer, western and central Oklahoma (ver. 1.1, March 2017): U.S. Geological Survey Scientific Investigations Report 2016–5180, 64 p., 7 pls., https://doi.org/10.3133/sir20165180. Ryter, D.W., and Correll, J.S., 2016, Hydrogeological framework, numerical simulation of groundwater flow, and effects of projected water use and drought for the Beaver-North Canadian River alluvial aquifer, northwestern Oklahoma (ver.1.1, February 2016): U.S. Geological Survey Scientific Investigations Report 2015–5183, 63 p., https://doi.org/10.3133/sir20155183. 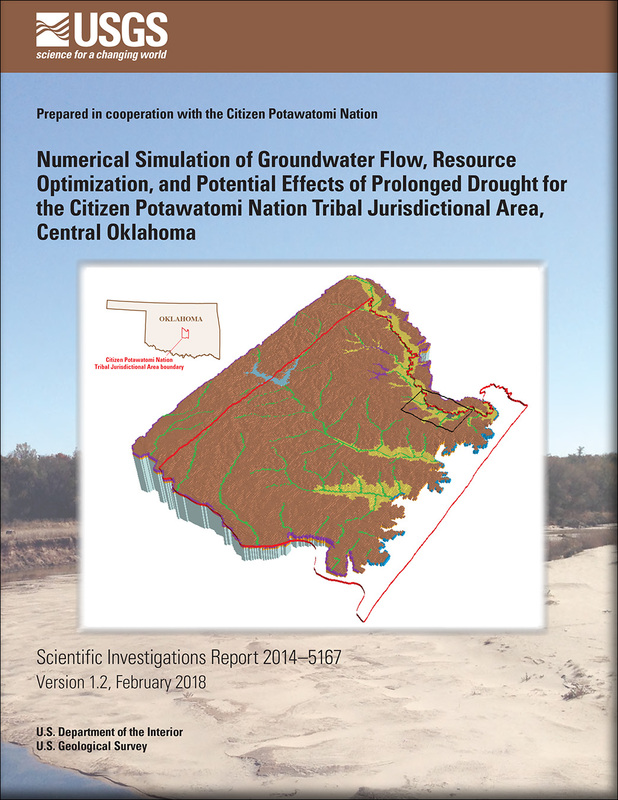 Ryter, D.R., Kunkel, C.D., Peterson, S.M., and Traylor, J.P., 2015, Numerical simulation of groundwater flow, resource optimization, and potential effects of prolonged drought for the Citizen Potawatomi Nation Tribal Jurisdictional Area, central Oklahoma (ver. 1.1, February 2016): U.S. Geological Survey Scientific Investigations Report 2014–5167, 27 p., https://doi.org/10.3133/sir20145167. Mashburn, S.L. ; Ryter, D.; Neel, C.R. ; Smith, S.J. ; Magers, J.S., 2014, Hydrogeology and simulation of groundwater flow in the Central Oklahoma (Garber-Wellington) Aquifer, Oklahoma, 1987 to 2009, and simulation of available water in storage, 2010-2059: U.S. Geological Survey Scientific Investigations Report 2013-5219, 108 p., https://doi.org/10.3133/sir20135219. Christenson, S.; Osborn, N.I. ; Neel, C.R. ; Faith, J.R.; Blome, C.D. ; Puckette, J.; Pantea, M.P., 2011, Hydrogeology and simulation of groundwater flow in the Arbuckle-Simpson aquifer, south-central Oklahoma: U.S. Geological Survey Scientific Investigations Report 2011-5029, 121 p., https://pubs.usgs.gov/sir/2011/5029/. Model archives for projects published prior to October 1, 2017 are available upon request. Model archives published after October 1, 2017 are available via the USGS Water Resources NSDI Node. 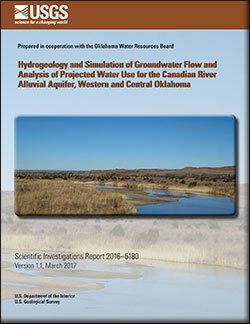 The objective of the study is to conduct an investigation of the hydrogeology of the Boone and Roubidoux aquifers that will provide information to the Oklahoma Water Resources Board that will enable that agency to determine maximum annual yield of the aquifers based on different proposed management plans. The objectives of this investigation are to describe the hydrogeology, and construct, calibrate, and use a numerical groundwater-flow model to simulate the effects of transient stresses and various pumping and climate scenarios for Reaches 3 and 4 of the Washita River alluvial aquifer. 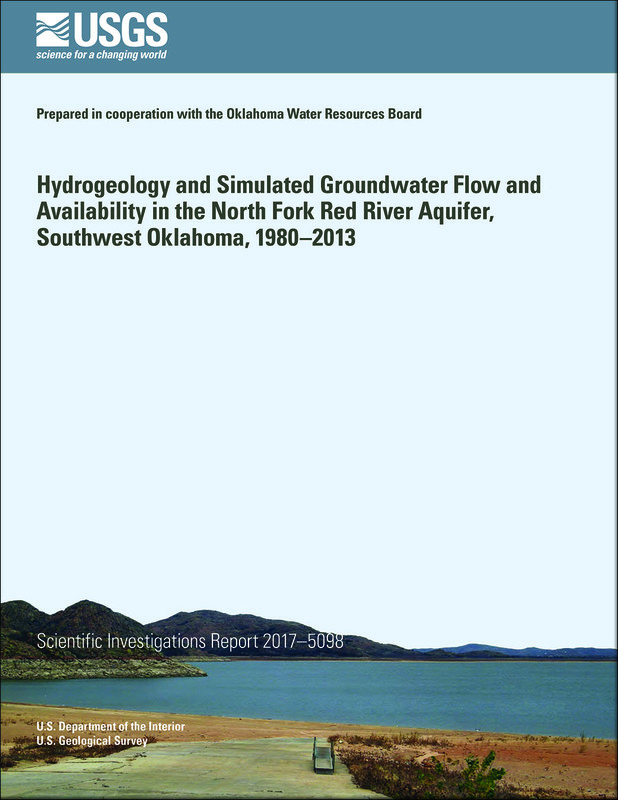 In 2012 the U.S. Geological Survey, in cooperation with the OWRB, began an update of the hydrologic investigation and development of a groundwater-flow model for the North Fork Red River alluvial aquifer in Beckham, Greer, Jackson, and Kiowa Counties. This project is a detailed study of the groundwater and surface water, the hydrogeology, climate, and base flow to streams, and the effects of water use and changes in weather and climate on the hydrologic system. The study includes field collection of groundwater and streamflow data, mapping the water table, aquifer base, and water use. 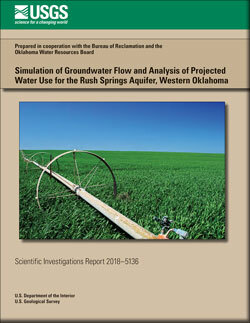 Contacts: William Andrews, Ph.D., Derek Ryter, Ph.D.
Ellis, J.H., 2018, Simulation of groundwater flow and analysis of projected water use for the Rush Springs aquifer, western Oklahoma: U.S. Geological Survey Scientific Investigations Report 2018–5136, 156 p., https://doi.org/10.3133/sir20185136. Mashburn, Shana L.; Ryter, Derek W.; Neel, Christopher R.; Smith, S. Jerrod; Magers, Jessica S.
Mashburn, S.L., Ryter, D.W., Neel, C.R., Smith, S.J., and Magers, J.S., 2018, Hydrogeology and simulation of ground-water flow in the Central Oklahoma (Garber-Wellington) Aquifer, Oklahoma, 1987 to 2009, and simulation of available water in storage, 2010–2059 (ver. 1.1, April 2018): U.S. Geological Survey Scientific Investigations Report 2013–5219, 92 p., https://doi.org/10.3133/sir20135219. Smith, S. Jerrod; Ellis, John H.; Wagner, Derrick L.; Peterson, Steven M.
Smith, S.J., Ellis, J.H., Wagner, D.L., and Peterson, S.M., 2017, Hydrogeology and simulated groundwater flow and availability in the North Fork Red River aquifer, southwest Oklahoma, 1980–2013: U.S. Geological Survey Scientific Investigations Report 2017–5098, 107 p., https://doi.org/10.3133/sir20175098. Ellis, John H.; Mashburn, Shana L.; Graves, Grant M.; Peterson, Steven M.; Smith, S. Jerrod; Fuhrig, Leland T.; Wagner, Derrick L.; Sanford, Jon E.
Ryter, Derek W.; Correll, Jessica S.
Ryter, D.W., and Correll, J.S., 2016, Hydrogeological framework, numerical simulation of groundwater flow, and effects of projected water use and drought for the Beaver-North Canadian River alluvial aquifer, northwestern Oklahoma (ver.1.1, February 2016): U.S. Geological Survey Scientific Investigations Report 2015–5183, 63 p., http://dx.doi.org/10.3133/sir20155183. Ryter, Derek W.; Kunkel, Christopher D.; Peterson, Steven M.; Traylor, Jonathan P.
Ryter, D.R., Kunkel, C.D., Peterson, S.M., and Traylor, J.P., 2018, Numerical simulation of groundwater flow, resource optimization, and potential effects of prolonged drought for the Citizen Potawatomi Nation Tribal Jurisdictional Area, central Oklahoma (ver. 1.2, February 2018), U.S. Geological Survey Scientific Investigations Report 2014–5167, 27 p., https://doi.org/10.3133/sir20145167. Christenson, Scott; Osborn, Noel I.; Neel, Christopher R.; Faith, Jason R.; Blome, Charles D.; Puckette, James; Pantea, Michael P.
Hydrogeology and simulation of groundwater flow in the Arbuckle-Simpson aquifer, south-central Oklahoma; 2011; SIR; 2011-5029; Christenson, Scott; Osborn, Noel I.; Neel, Christopher R.; Faith, Jason R.; Blome, Charles D.; Puckette, James; Pantea, Michael P.